1. 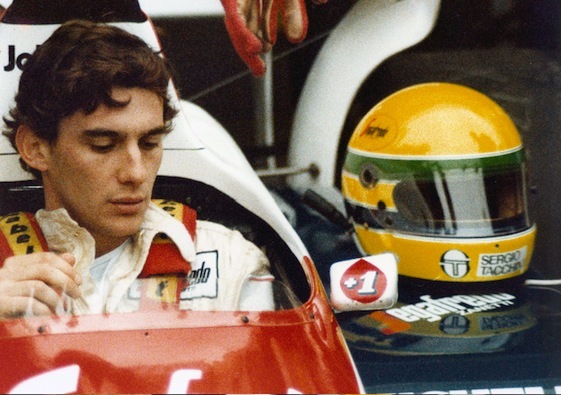 Using the long familiar helmet in Brazilian yellow as a leitmotif, the film by Asif Kapadia pushes the boundaries of a documentary much in the same manner Ayrton Senna pushed the boundaries of performance in a race car. No talking heads here in place of New Wave-like editing of existing footage – except for Senna himself, who provides the introspection that allows Kapadia to render an artist’s portrait. 3. A four-time world champion who is a loser in this thoroughly biased account, Alain Prost is portrayed as a little man with lots of ego, charm, talent and intelligence without much soul to go with it. It has always been clear that Prost and fellow countryman Jean-Marie Balestre, the president of the sanctioning body FISA, each held the same ambition of having the French driver win the world championship even if it meant the ongoing use of politics and duplicity at the expense of Senna. In this case, the film artfully renders a verdict. Ayrton Senna, perhaps the greatest of them all. the same time such as Prost and Senna. Sadly, Senna’s death at age 34 short-changed any further mano-a-mano with Michael Schumacher, one of the many shards of loss both great and small touched on by the film. 5. Current F1 fans should consider themselves fortunate to have three guys who fall into the category of having great talent and who all think they own the track: Sebastian Vettel, Lewis Hamilton and Fernando Alonzo. It shouldn’t detract from their greatness that these drivers are not constantly cheating death in a race car as well as trying to beat one another thanks to the safety efforts made in the wake of the deaths of Roland Ratzenberger and Senna on the same weekend at Imola 17 years ago. We are led to believe – like in many political tell-all diaries – that although predeceding decision makers were at times foppish fools, the present crop at the FIA are glowing pillars of professionalism. 7. Whatever one’s take on Senna’s conviction about God, his conversations indicate a respectful belief in an all-knowing, omnipresent and approachable deity. It was easy enough for a driver like Prost, or cynical non-believers, to snidely remark that Senna’s religion made him feel invincible and that he was therefore dangerous to other drivers. By contrast, the film portrays Senna as a driver who fully recognized his own vulnerability as well as greatness. 8. Part of the den of F1 politics included another aspect of jingoisim – journalists. For those working in media centers during that era, it was clear there was a prevalent feeling among British journalists that Senna didn’t quite rate due to over-aggressiveness, as if he was a rude colonial coming in out of the South American jungle. This was yet another of the political hurdles faced by the Brazilian as evidenced by an interview with broadcaster and former world champion Jackie Stewart, who tries to take Senna to task. 9. The family of Senna obviously had a hand in the making of the film as well. As family portraits go, it’s no more or less flattering than most. 10. I, for one, believe that Senna’s fatal problem was loss of blood after his visor and skull were pierced by a suspension piece in an otherwise routine, but violent crash. Thanks to the comments of close friend and physician Sid Watkins, who tended Senna after the crash, the film allows for the possibility that Senna had enough consciousness to recognize his impending death after the injury. The comments of Watkins suggest Senna once again rose to the occasion by recognizing the awful humiliation, fear and anger of dying before responding with his characteristic courage by reaching out to embrace his God. Quote of the Week: “Sid, I can’t quit.” – Ayrton Senna responding to F1’s physician Sid Watkins after the latter suggested they both leave their jobs in F1 and go fishing following the death of Roland Ratzenberger at Imola; the day before Senna’s fatal crash. If Alphonso wasn’t my favorite nickname for Alonzo before, it is now. An honest mistake made in the heat of battle that we’ll change. Even as late as the 1990’s, F1 was still drawn along lines of nationalistic points of view. As I say, many of the British journalists had their point of view of Senna that was also steeped in cultural bias. As stated, the great drivers then and now all think the track belongs to them until proven otherwise. Senna was no different among great drivers in this respect. Those who don’t like a driver will always make this charge — but rarely against their own favorites. Personally, I’d choose a guy who causes a high-speed crash that also endangers himself over a guy who chooses a slow corner to take out an adversary so he can be sure to walk away and claim a championship. It is motor racing, after all, and who has the biggest gonads is always a factor. The documentary was great, but as usual it paints Prost as the jealous little French villian, with the head of the FIA in his pocket. This has never been conclusively proven, and conspiracy theorists just point to them both being French as reason enough. It’s borderline racist. I suggest reading “Senna vs Prost” by Malcolm Folley. It tells a much more even-handed account from both sides of the argument. Yes, Ballestre had it in for Senna, no question, and wanted a French champion to rule the roost, so of course he fought Senna anywhere he could. But Prost (and others backed this up) never had much of a relationship with Ballestre, and never really liked him. Prost, in fact, had very little in the way of patriotism, moving out of France shortly after becoming an F1 driver, and mentioned that the French fans weren’t particularly high on him anyway, especially after his fight with Arnoux. Senna and Prost even became friends (of a sort) after Prost retired, Senna constantly calling him on the phone for advice and to talk about the state of F1. The real “villian” is a driver who would use a 190 mph racecar without fenders to intentionally run another driver off the road. A villian is a driver with a gigantic ego and sense of entitlement, believing everyone else on the track was beneath him and should move over immediately. And when they don’t, simply push them out of the way. Of course, a lot of fans prefer to call that “passion” and “excellence,” or some such. One problem with living in a small Southern town … it’s not showing literally “within 40 miles” of here according to searches I’ve done. Guess I’ll have to wait until it comes out on DVD. Mr. Ingram, thank you for this brilliantly written article. At times soaring to near poetry with word selection and the turn of a phrase, you make the reader care about Senna and anxious to see the movie. Sports writing only rarely reaches this level of the writer’s art. Roger Angell’s paeans to baseball have little on this work. Thanks again and I hope you at least get comped to the premiere!